Once again, the season has changed here at Jim Jenkins Lawn & Garden Center. We have EVERYTHING you need to create a SPECIAL Holiday atmosphere both inside and outside of your home! 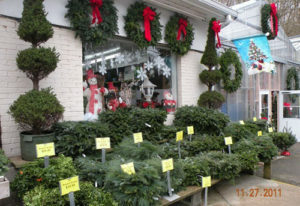 We offer a large selection of both fresh cut and live Christmas trees. We have the Cadillac of trees, the NOBLE FIR from Oregon as well as Concolor Fir, Douglas Fir and Fraser Fir from both Pennsylvania and North Carolina. Live trees include Colorado Blue Spruce, White Pine and Alberta Spruce. 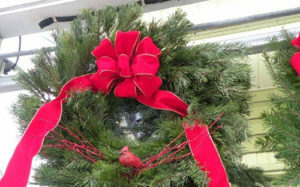 Need a special wreath or garland for your home or to give as a gift ? Stop in and watch us create beautiful decorated live green wreaths…choose a premade beauty or choose your own ribbon and decorations and have us create an original just for you ! Choose wreaths and greens from our HUGE selection of Fraser Fir, Noble Fir, Douglas Fir, white Pine, Scotch Pine, Concolor Fir, Boxwood, Red Pine, Port Orford Cedar, Incense Cedar, berried Juniper, Silver Fir, Shore Pine and mixed Oregon…plus much more. We carry bundles of greens for hundreds of uses, and wreaths are not just round…we have candy cane shaped, tree shaped, squares, crosses and many other unique and unusual live green selections. The decorating possibilities are endless with the special selections you will find here. You will not recognize the inside of our store ! The elves have been very busy getting ready for Santa and this year they created some very unusual displays of decorations and gifts. We have unique garden gift items and decorations that are sure to impress many on your gift list. 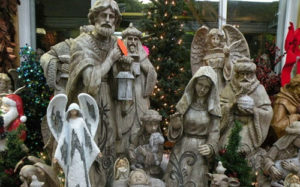 We are your one stop shop for everything you need to decorate…lights, tree toppers, tree stands, flags, nativity sets in all sizes, ornaments, statuary, table decorations and so much more. Our PITTSBURGH PRIDE is shining bright in our Steeler and Penguin department ! All new sports ornaments and great gift items are ready for you to take home and put onto or under your tree. Check out our "Mooning Steeler Santa", sure to bring a smile to any fans' face, and all new this year we have great Steeler and Penguin gift sets including wallets, keychains, flashlights and pens. And for the hunters on your list we have Shotgun Shell wreaths and lights ! We definitely have something for everyone on your gift list, especially those hard to buy for men! Your shopping and decorating will not be complete until you visit us here at Jim Jenkins Lawn & Garden Center. We will definitely make your season BRIGHTER ! Don't forget your New Years and Valentines Day flags ! We are open all winter to provide you with quality FIREWOOD and ROCKSALT. MERRY CHRISTMAS AND HAPPY NEW YEAR FROM ALL OF US AT JIM JENKINS LAWN & GARDEN CENTER! Living Christmas trees are a memory maker that can last a life time. Used on your porch or patio, they say "Welcome to Our Home" when decorated in traditional style. Or, use indoors for up to one week as your holiday tree, just be sure to plant it as soon as the Holidays are over. Living Christmas trees are a perfect way to enjoy family tradition and have the added benefit of a new tree in your landscape. Some Christmas celebrations are important enough to commemorate by planting the tree that was an intimate part of the Holiday. IT IS ADVANTAGEOUS THAT BEFORE THE GROUND FREEZES YOU LOCATE AND DIG THE HOLE FOR PLANTING AS SOON AS POSSIBLE, EVEN BEFORE PURCHASING THE TREE ! Since your live tree is out of its' natural environment, the shorter time on display the better chance of survival. Five to ten days is preferred inside your home. All of our trees are displayed free standing so that you can see all sides. Most of our trees are under roof to keep them dry and free of snow and ice accumulation. When selecting your tree, make sure that the “handle” at the bottom is long enough to allow the trunk to fit into your tree stand. Request that some bottom branches be removed if necessary. You can use these extra branches for other decorating. Every Christmas Tree sold here is drilled, shaken (to remove loose needles), given a fresh cut, baled with biodegradable netting and loaded into or onto your vehicle. Take your tree home and immediately place it into the stand with hot water. If using a tree bag, place it over the trunk and make a hole for the trunk to go through. Once a fresh cut is made, the tree MUST be put into water within two hours or it will start to form sap to “heal” the cut and then will not drink water. If needed, place the fresh cut trunk into a large bucket of water until you have your stand ready. NEVER ALLOW THE CUT TRUNK TO GO DRY ! If the tree is not put into water, another fresh cut needs to be made before setting into the stand. Do not bruise the cut trunk or allow it to get dirty as this will inhibit water uptake. Use a stand that fits your tree ! We suggest ‘BOWLINGS LAST STAND’ or the STAND STRAIT System, the only stands we stock. Ask us what size stand is appropriate for the size tree you have chosen. As a general rule, stands should provide 1 quart of water per inch of trunk diameter. Also keep in mind that a smaller stand will require more frequent refilling. Avoid whittling the sides of the trunk down to fit the stand. The outer layers of wood are the most efficient in taking up water and should not be removed. ALWAYS USE HOT WATER AND A PRESERVATIVE every time you refill your stand. The first few days the tree can drink up to one gallon of water, so check your stand at least twice a day. DO NOT USE aspirin or sugar, this does nothing for the tree and could lead to a build up of bacteria in the water which can cause a bad odor. Keep your tree away from heat sources such as fireplaces, heaters, heat vents and direct sunlight. Lowering the room temperature will slow the drying process and result in less water consumption each day. CHECK THE STAND DAILY to be sure that the level of water does not go below the fresh cut on the trunk. With many stands, there can still be water in the stand even though the base of the tree is no longer submerged in water. NEVER allow the fresh cut to go dry ! We have convenient long watering tubes so that you do not have to crawl under the tree…some even sing to you to let you know the stand is getting low on water ! Apply WILT STOP, an anti-transpirant, to the branches to help prevent moisture loss and needle drop. The more moisture your tree has, the stronger the scent will last. Use of miniature lights will produce much less heat and reduce drying of the tree. Always inspect light sets prior to placing them on the tree. If worn, replace with a new set and do not overload electrical circuits. Monitor the tree for freshness. After Christmas or if the tree is dry, remove it from your home. 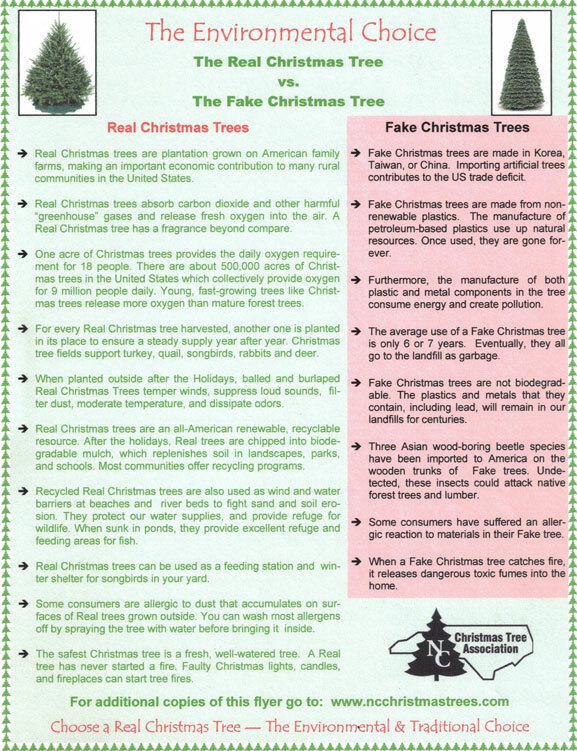 Check with your local municipality regarding tree recycling. Consider laying the tree beside your bird feeders and bird baths until Spring to give the birds safe perching spots. With proper care your tree will stay fresh throughout the Holiday Season. All of our Christmas trees are free standing so that you can see the entire tree on all sides to help you make your selection easier. We have many trees under roof so that you can see your tree dry and free from snow and ice accumulation. We are proud of our selection and services and many customers who came with their parents to choose their tree years ago now bring their children to continue the tradition. Just please do not tease Jim about his age ! NOBLE FIR- These royal beauties are shipped to us from Washington state. This tree has a horizontal branching structure that is great for holding many ornaments. The branches are very strong so they will hold larger and heavier ornaments. It is a deep green color and has a strong pine scent with short, soft needles. The Noble Fir has a lot of history. The first ships were built from Noble Fir wood due to its strength. We are one of very few Garden Centers to sell this tree, as the freight costs more than the trees ! These are the first to sell out so shop early for this unique specimen. Concolor Fir- This unusual tree is grown in Pennsylvania. Concolor has long, soft needles of a bluish-green color with a very unique citrus scent. This tree has a gorgeous shape and is the second type to sell out! Douglas Fir-This popular tree is also grown in Pennsylvania and has short, soft needles on strong branches. Douglas fir tends to be very thick and wide at the base. 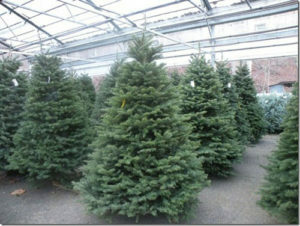 Fraser Fir- We carry Fraser firs grown in Pennsylvania and North Carolina. It has short needles that are green on top and silver underneath. This is the tree most consider to be the "traditional" tree. The Fraser Fir can only be grown at high elevations as temperatures above 70 degrees will cause needle drop during growth seasons. The North Carolina Fraser Firs tend to hold their needles longer than the Pennsylvania grown varieties. Every Christmas Tree sold at Jim Jenkins Lawn & Garden Center is trimmed to your specifications, drilled, shaken to remove any loose needles, given a fresh cut, baled with biodegradable netting and loaded into or onto your vehicle. We realize that you have many choices for your Christmas Tree purchase and we would like to thank you for supporting a locally owned and operated family business. 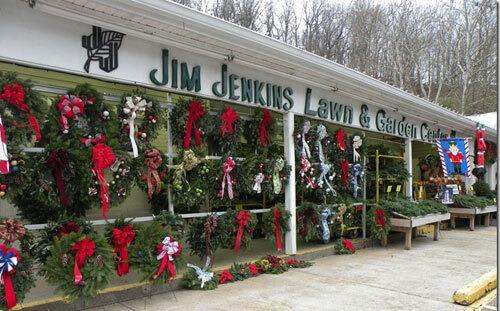 Jim Jenkins has been in business 30 years and we think that we have some great services that set us apart, not just our large selection and varieties of trees, wreaths and greens.